The biggest news to come out of Computex, AMD’s second generation of its Ryzen Threadripper platform, is almost here. Today’s announcement is all amount images, speeds and feeds, specifications, and an ‘unboxing’ announcement, leading to pre-orders a week before retail. As much as it pains me that there is an unboxing embargo and pre-orders before we even know how the new chips will perform, here we are. Today we get to go through the on-box specifications, discuss the design, and show what AMD included in our press kit. The formal launch of the new parts is one week from today, and in the biggest markets the first processor of the launch should be available for pre-order. 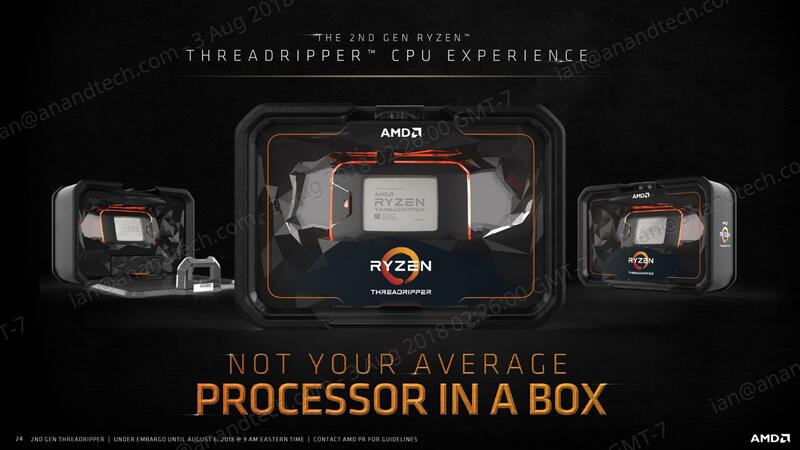 AMD is set to launch four versions of its second generation Ryzen Threadripper over the course of Q3, starting with its flagship 32-core. Sitting at the top of the stack is the 32-core 2990WX, which will retail at $1800, competing directly against Intel’s existing 18-core part, the Core i9-7980XE. 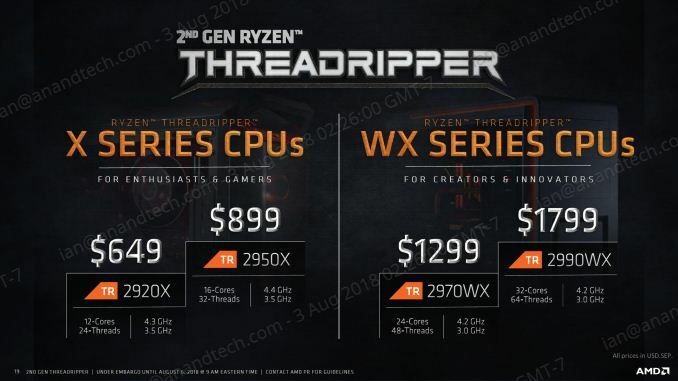 AMD is using "WX" in the name here to offer some branding consistency with their high-end workstation graphics models, the Radeon Pro WX series. Beating at its heart are four 12nm "Zen+" Zeppelin dies, each with eight cores, connected by AMD’s Infinity Fabric, and using simultaneous multi-threading for a total of 64 threads. As with previous generations, there are 60 PCIe 3.0 lanes for add-in cards and storage, and another four lanes for the chipset. There is a slight change in the memory speed, with the new parts supporting DDR4-2933. Joining the WX line is the Ryzen Threadripper 2970WX, set at $1299 MSRP. This 24-core part uses three cores per CCX (so six cores per die, four dies per package), and also has simultaneous multi-threading for a total of 48 threads. Speeds are equal to the TR 2990WX, with a 3.0 GHz base clock and a 4.2 GHz single core turbo. Per-core turbo speeds will be decided by Precision Boost 2 and XFR2, as explained below. The 2970WX is set for an October launch. Both of the WX models are hitting the new TDP of 250W, although the way AMD measures TDP is heavily dependent on the cooler used. In this case, their new high-end ‘Wraith Ripper’ cooler is the benchmark, which is developed by Cooler Master. This new cooler is very large, but offers full heatspreader coverage – which as we've discovered is critical for Threadripper cooling – and provides good clearance for memory. It will be sold separately in the channel, at around $100 MSRP. Also on the table are the 2950X ($899) and the 2920X ($649), which use the existing X branding. 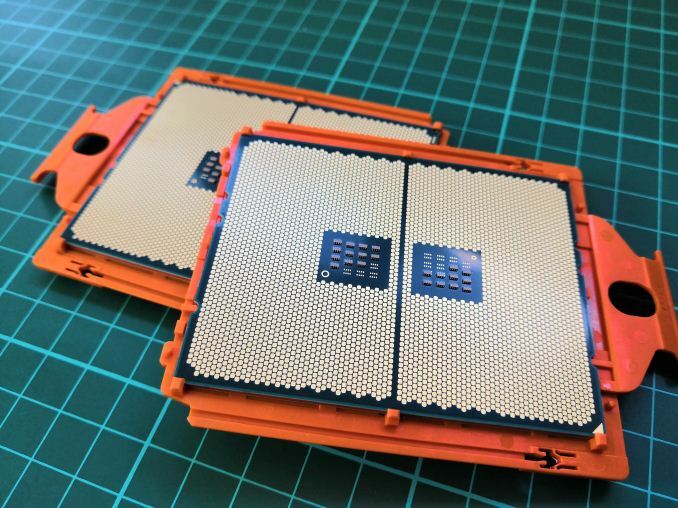 This is because these processors are direct replacements for the 1950X and 1920X, using only two active dies in each chip, but this time around are using Zen+, the second generation Ryzen features such as faster caches and better frequency characteristics. The 16-core TR 2950X will have a base frequency of 3.5 GHz, a turbo of 4.4 GHz, and is due to launch on August 31st. The 12-core TR 2920X by comparison also has a 3.5 GHz base frequency, but a slightly lower turbo at 4.3 GHz, and is due out in October. Both of these parts are set at 180W TDP, like the first generation chips. At this point AMD has not stated if it will expand the family even further, so we don't know if the 1900X will stay at the bottom of the stack, be replaced with a 2000 series model, or if it dies off completely. At this point, AMD’s main competition is still with Intel’s Skylake-X parts. The 32-core 2990 WX will align in price with the 18-core Core i9-7980XE. Across the metrics, AMD has more cores, is competitive on frequency, has more memory channels, more PCIe lanes, and supports higher memory clockspeeds. Intel has lower power, and above 16 cores a slight turbo clockspeed advantage. Meanwhile we already know from Ryzen 2000-series testing that cache speeds are a back-and-forth competition, and Intel has a slight IPC advantage. Game on. AMD already created a gaming mode on the top model of previous Threadripper, which disabled cores. If that doesn't tell people these aren't supposed to be gaming chips what will? I wish that those DDR4 prices would come down though.